Join the love fest on February 9 from 8:30-12 at a half-day workshop in Smith Brasher Hall on Central New Mexico Community College’s Main Campus. The registration fee for the workshop is included in the yearly membership fee. Parking is free on Saturdays, and we will serve a continental breakfast during the opening reception from 8:30-9:00. You will then have a choice of workshops to attend from 9:00-9:50, 10-10:50, and 11-11:50. NMTESOL will hold its 6th Annual Spring Workshop at CNM in Albuquerque on Saturday, April 16th 2016 from 9:00am to 1:00pm. We invite you to submit a proposal for a 75-minute presentation at the workshop. Presentations can cover any aspect of English language teaching at any level. Please complete the form at this link https://www.surveymonkey.com/r/NMTESOL2016SpringCall to submit your proposal. The deadline for proposals is Saturday, April 2nd. BECOME A PRESENTER: NMTESOL and NMAEA are accepting proposals for presentations at the 2015 conference. Details on conference tracks, presentation types and lengths, and submission guidelines may be found in our Call for Presenters document found here: 2015 NMTESOL + NMAEA Call For Presenters The deadline for proposals is September 18th. 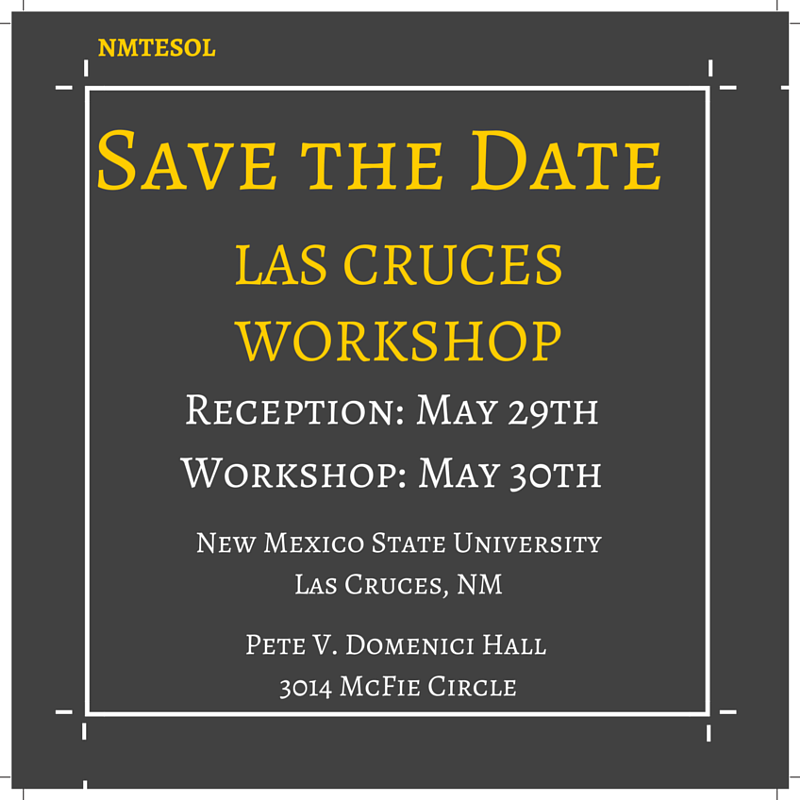 NMTESOL will hold its first Las Cruces Workshop at New Mexico State University on Saturday May 30th, 2015 from 9:00 AM to 1:30 PM. We will also be co-hosting a reception on Friday evening, May 29th with NMSU’s Center for English Language Programs in honor of 54 Ecuadorian teachers participating in the “Go Teacher” program. We invite you to submit a proposal for a 75-minute presentation at the workshop. Presentations can cover any aspect of English language teaching at any level and can be a presentation by a single speaker or a panel of speakers. Please complete the form at this linkhttps://www.surveymonkey.com/r/LasCrucesPresenters to submit your proposal. The workshop will take place Saturday, April 11th at CNM’s main campus in Albuquerque on the 3rd floor of the Max Salazar Building. Registration for NMTESOL’s 5th Annual Spring Workshop is now open! Registration is $10 per person and can be paid in advance by using PayPal online, snail mailing a check to our mailing address, or on the day of the event by cash or check.The Spring Workshop will be in Albuquerque on April 11th, 2015 from 9:00am to 1:00pm on the main campus of Central New Mexico Community College, 525 Buena Vista SE in Albuquerque. If you are interested in sharing your expertise with your colleagues, we are currently accepting proposals for 75-minute presentations at the workshop. Presentations can cover any aspect of English language teaching at any level and can be a presentation by a single speaker or a panel of speakers. If you’re interested, please complete the form at this link https://www.surveymonkey.com/r/2015SpringPresenters to submit your proposal. NMTESOL will hold its 5th Annual Spring Workshop at Central New Mexico Community College’s Main Campus in Albuquerque on Saturday, April 11th 2015 from 9:00am to 1:00pm. Please complete the form at this link https://www.surveymonkey.com/r/2015SpringPresenters to submit your proposal. We hope to receive your proposal soon and look forward to seeing you in April! We’re planning our 2015 Spring Workshop! Please check back for updates soon. If you’re interested in presenting at this year’s workshop, please email a proposal for a 75-minute presentation to contact@nmtesol.org. Topics related to English language teaching/learning are welcome! Our 2014 Fall Workshop is just around the corner! Make sure you register now for this free day of professional development. The workshop will be held on Friday, October 3rd from 10am to 5pm at the Workforce Training Center of Central New Mexico Community College in Albuquerque (5600 Eagle Rock Ave NE, Albuquerque, NM 87113). There will be three academic sessions covering various topics related to English language teaching; lunch; and opportunities for networking. Deadline for Speakers is Approaching! There’s still time to submit a proposal for a 75-minute presentation at the NMTESOL Fall Workshop! The deadline for proposals is Friday, September 26. Please pass this information on to those you work with in the fields of English language teaching. The NMTESOL Fall workshop is Friday, October 3rd from approximately 10am to 5pm at the Workforce Training Center of Central New Mexico Community College in Albuquerque. Register NOW for the 2014 Fall Workshop! Registration for our Fall Workshop is now open! We are still accepting submissions for presentations at the workshop. Presenting at a professional development workshop is an excellent way to share your knowledge and contribute to our professional community. Take a moment to consider the learning activities that are most successful for your students, or a classroom concern that confronts all English language teachers (or learners), and how you can share your expertise with colleagues! Please join us for our Fall Workshop on Friday, October 3rd , 2014 at CNM’s Workforce Training Center 5600 Eagle Rock Ave NE, Albuquerque, NM 87113. More information about how to register for this workshop will follow shortly!